We offer several relaxing massage treatments. Please look over our menu. 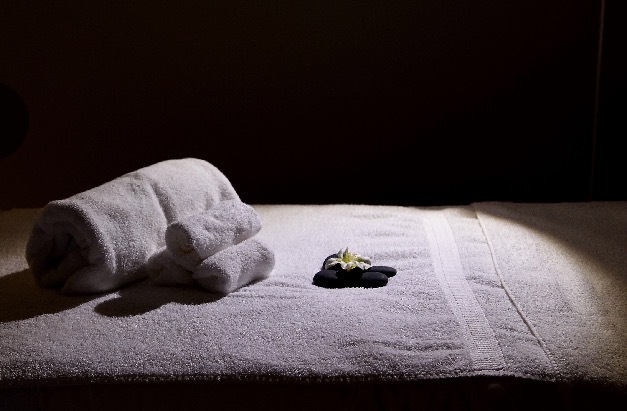 All of our body treatments aim to decrease stress, relieve tension, and leave you feeling light and refreshed. Relax both your mind and body. This invigorating massage treatment is wonderful for relaxing tense muscles. Thai massage or Thai yoga massage is an ancient healing system combining acupressure. Thai massage according to the Traditional Thai Medical Professions Act, BE 2556 (2013). Instead of the relaxing gliding and kneading motions characteristic of more popular forms of massage, Thai massage employs stretching, pulling, and rocking techniques to relieve tension and enhance flexibility and range of motion. It is sometimes called the “lazy person’s yoga.” The therapist uses his or her hands, knees, legs, and feet to move you into a series of yoga-like stretches and also applies deep muscle compression, joint mobilization, and acupressure. Thai massage also utilizes energy work, which, according to ancient Asian culture, treats the subtle energetic field within the body. It corrects blockages, deficiencies, and imbalances in the flow of this energy, which then is believed to improve the client’s health. Heal your whole body via the feet with this foot treatment. Massage techniques within the reflexology sequence and a combination of gentle pressure will sedate nerve endings and generate a deep, tranquil relaxation.